Following the M-Audio Axiom Keyboards; Shipping Update, Final Cut Support? M-Audio had a big role in popularizing the cheap, simple USB/MIDI keyboards that are ubiquitous today. By about a year ago, though, M-Audio’s own options were looking somewhat lacking: while still very affordable, they lacked the variety of controls on some of their competitors, plus higher-end features like aftertouch that had begun to make their way to budget-priced models. At NAMM in January, M-Audio unveiled their answer: the all-new Axiom line. These keyboards look and feel better than the previous models, and add features like assignable aftertouch and semi-weighted keys. But, to quote Gypsy, you gotta have a gimmick, and this is the deal-closer for many people: 8 built-in trigger pads, a la M-Audio’s Trigger Finger. I general, I love the m-audio gear that I’ve got, but the Axiom 61-key controller would really fill a need for me and have been waiting anxiously for it to start shipping! I wrote to M-audio’s sales department this morning to see if I could get some straight-scoop from them. According to the sales dept, they’re expecting to ship the 61-key versions later this month (end of June in his exact words). The transport controls to me are just killer and if I could just find a way to map the sliders to Final Cut Pro’s audio mixer, man I’d be in business. So there you have it. That’s consistent with the shipping promises I’ve heard. 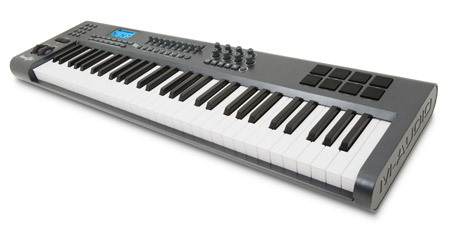 I’m not sure why 25-key keyboards tend to ship first (Novation, Alesis, here’s looking at you). Maybe DJs are buying up 25-key versions in bulk and we need to go out and buy more keyboards with some octaves on them? No clue.